For our last practical class, we made the Alhambra. Before this class, I had never heard of Alhambra other than the palace in Granada in Spain. (Interesting side note: on our drive to the Alhambra in Spain, we lost a piece of our rental car on the highway. The rental agency didn’t seem to mind, and we were never charged for this odd incident.) 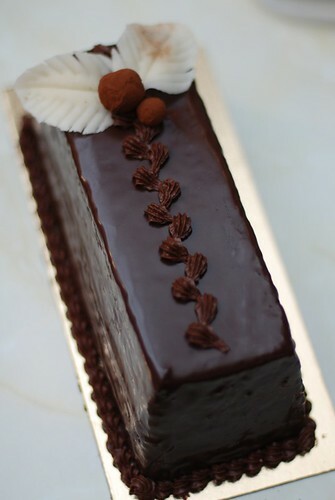 Anyway, the alhambra cake is like a sacher torte; it’s basically a fluffy hazelnut sponge cake with lots of ganache. 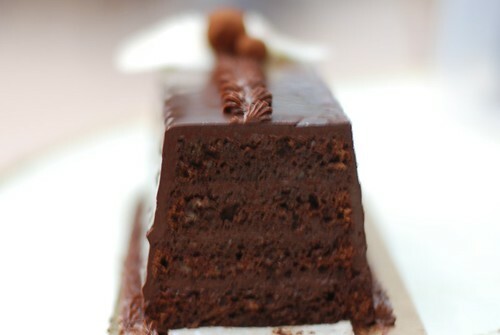 Since the French love to “imbibe” their cakes, the cake layers are generously doused with coffee and rum flavoured syrup, too. During the demonstration, I had a laugh to myself every time the chef mentioned flour. After the previous incident with the pistachio log cake, I knew flour was something I just couldn’t forget anymore! 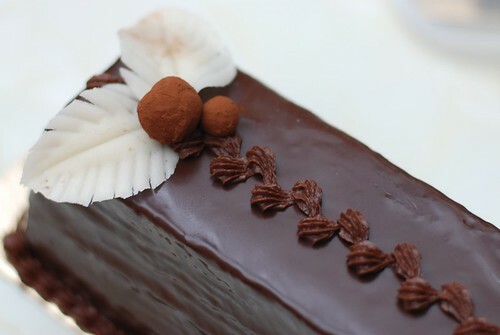 When the chef passed around scraps, I fell in love with this cake instantly. 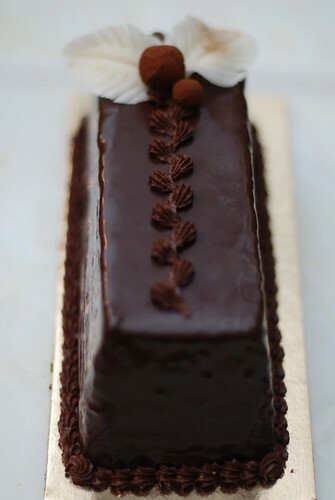 I loved it so much without any ganache or syrup that I was super excited to hear we would be making two cakes in class – one all dressed up, one on its own. I actually think this cake recipe would make great cupcakes. They are not too dense, but still hold their own weight enough so that with a little bit of vanilla (or cream cheese!) buttercream on top, they’d be delicious! We had the older chef for our last practical class. The class cheered when he walked out of the chefs-only elevator. I’ve learned from bits and pieces that this chef actually was a very highly regarded chef in Paris who owned a magnificent shop in the 14th back in the day. In fact, one of the current chefs on full time staff at the school was actually his apprentice at some point! Chef has been a consultant to some pastry boards around France since selling his shop, and now he teaches at Le Cordon Bleu because he loves patisserie and can’t quite pack it in yet. He is easy and calm to work with, unlike what I would have imagined with “old school chefs”. He’s helpful, too, and always has tricks up his sleeve to help students out. 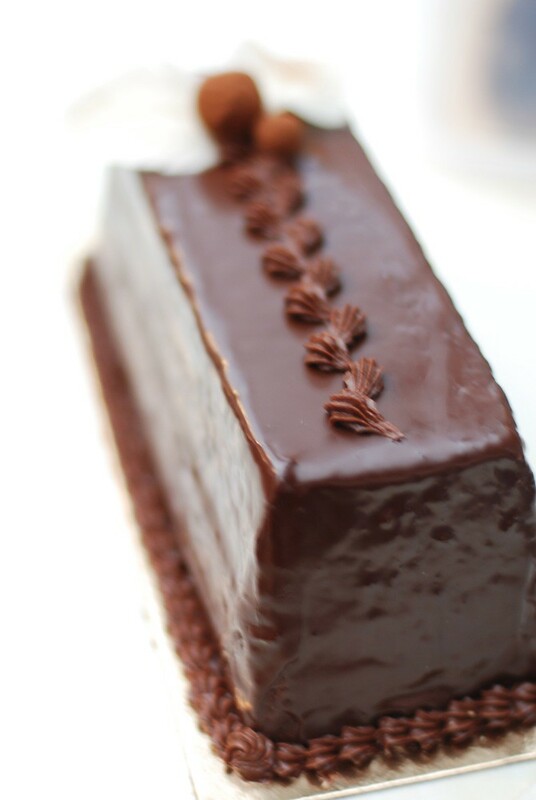 In this class he helped me make my ganache come back together with a little bit of hot water – it looked good as new with that little fix! I left behind most of my cake at school, and meant to bring home a little slice along with the un-chocolate-ganache’d cake. Before I could even make it home, though, two celebratory stops at the bars (in honour of our last class) made sure that my cakes were devoured alongside drinks and savoury snacks. I can’t believe the first semester went by so quickly, and then it was off to preparing for the final practical exam! My friend and I agreed that we were finally beginning to get comfortable laughing and joking in the kitchens, and of course the term ended right then. I’m really going to miss the fun in the kitchen; I have no idea what next semester will bring!